are looking for and which skills they must possess. Create performance-based job de- scriptions before you start looking. As part of those descriptions, include the personality profile that best matches the position as well as your company culture. By doing so, you will already clearly know whom you are looking for and how to vet them. Just like the marketing described above, really knowing the psycho- graphics of your targeted, ideal employee allows you to then strategically mar- ket for applicants who meet such descriptions, and those outside your criteria will probably never waste your time. By marketing for employees, I don't mean simply running "help wanted" ads. Instead, through your circle of influence—both live and on social media—get the word out about the opportunities your business has to offer to the right employees. By marketing the posi- tions in this way, people you know and trust may be able to refer or recommend someone they know and trust. And, by predicting the staff you will need well before you need them, you can make recruiting an ongoing activity the entire team can help with. If recruiting is ongoing, you can also hire early if the right person comes along. is can help eliminate the challenges and disappointments that can come with hiring the wrong employees out of need, often times much more expensively than hiring the right person early. Big things can come in small packages! | need 20 prospects to say "yes" to your way of doing business at your price. With 20 prospects as the mission for your marketing, why would you cast a huge net with your marketing dollars? Wide nets yield unqualified leads, wasting valuable time and effort as you sift through them. Instead, shift your mindset to identifying, finding and attracting the right 20 people and projects your business needs. You may still spend the same overall dollars on marketing, but with such a change in mindset, you could use much more of that money to do research and then strategically target your desired sliver of the marketplace. One way many remodelers do this is by considering the psychographics of their target buyers—their motivations and buying habits. By knowing what is important to your specific customer type, and how they process their de- cisions, your business can then tailor its mes- sage to attract that sliver of the marketplace. e idea is that your messaging speaks to and attracts a certain psychographic, while at the same time helps prevent others with a differ- ent psychographic from wasting your time. Remember, you only needed 20 to say "yes." STOP HIRING AND START RECRUITING ere is already a serious shortage of skilled workers, and the problem will only get worse. To find new employees, most remodelers wait until it's too late. en they run "help wanted" ads to find someone as soon as possible. It is the same problem as marketing: You cast a wide net and you may hire the wrong people. If you need only one or two great employ- ees, why not seek to find those specific people? Again, it pays to be strategic about whom you eople who tend to have the most success running and owning a re- modeling business don't do what everyone else does. ey seek to be different. ey do things others don't do, won't do and/or haven't yet thought to do. When I owned my remodeling business, I didn't want to be the best remodeler in my market. Instead, I wanted to be the only one to offer what we did and how we did it. is may seem unusual or even a foreign strategy to most remodelers. However, I think the strat- egy can be a secret weapon for remodelers— one they can use to achieve higher margins and to attract and keep great employees. Being in competition with other remodel- ing businesses usually means one business is always trying to one-up the others to retake the top. It can also can mean dropping your price because, unfortunately, that is how many busi- ness owners define being competitive. When you fall into the mindset of being competitive, you also run the risk of thinking too big. For example, competitive businesses often believe they must be able sell to anyone and, therefore, be able to market to everyone in their area—just like their competition does. ese competitors also market what makes them better, which only confirms that their offering is pretty similar to all the other re- modelers in town. is, in effect, can make your market too big and increase competition, and it helps turn the business into a commod- ity. For some customers, it's like buying pre- mium gas for your pickup truck: Is there any reason to pay more when regular gas will do? THINK SMALL INSTEAD, BUT BE TARGETED When it comes right down to it, how many jobs and customers do you really require each year? 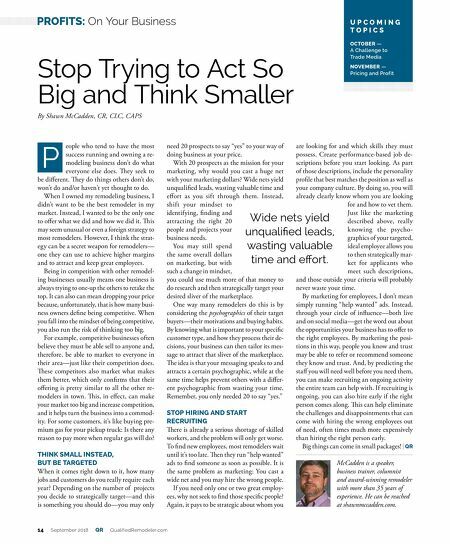 Depending on the number of projects you decide to strategically target—and this is something you should do—you may only Stop Trying to Act So Big and Think Smaller By Shawn McCadden, CR, CLC, CAPS U P C O M I N G T O P I C S OCTOBER — A Challenge to Trade Media NOVEMBER — Pricing and Profit Wide nets yield unqualified leads, wasting valuable time and effort. 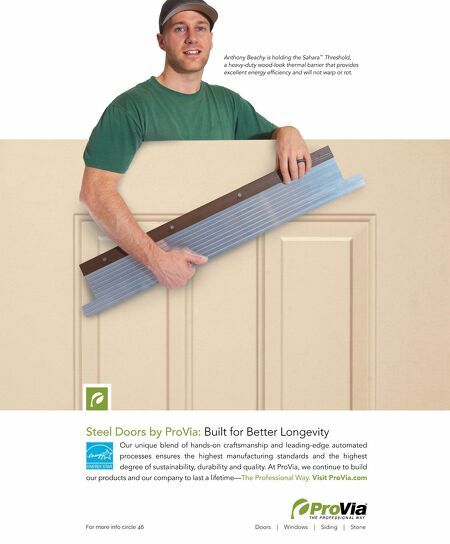 P 14 September 2018 QR QualifiedRemodeler.com PROFITS: On Your Business McCadden is a speaker, business trainer, columnist and award-winning remodeler with more than 35 years of experience. He can be reached at shawnmccadden.com.